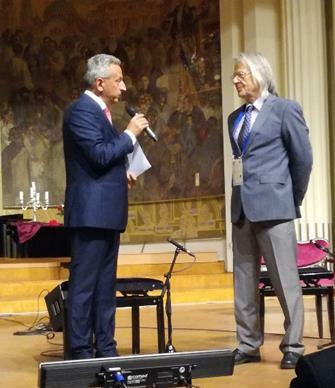 It was my great pleasure to welcome you to the joint annual congress of the European Society of Veterinary Pathology (ESVP) and the European College of Veterinary Pathologists (ECVP) in the beautiful city of Cluj-Napoca, Romania at the University of Agricultural Sciences and Veterinary Medicine. I hope you all enjoyed our Joint ESVP and ECVP Congress from September 5 – 8 in 2018. I must say it was a wonderful meeting for several reasons. Firstly, it was my first visit to Romania and it was a very pleasant experience scientifically and culturally. It shows there are lot of wonderful places in Europe and it seems sometimes you don´t have to travel too far way in order to become exposed to new seemingly not over-crowded picturesque and historically highly impressive places. Thanks to the local organizer for selecting just a wonderful and interesting place for our meeting. My personal highlight was the music presentation at the welcome reception on Wednesday evening. This was really overwhelming, especially for me, a non-regular, if at all, opera-goer. I realized again that there are so many exceptionally talented people, underlining again the individual uniqueness and excellence of humans, a fact we sometimes tend to forget nowadays. Furthermore, recognizing these outstanding endowments one could become really jealous being just a normal, regular pathologist. Scientifically I must say this was a well-balanced and professionally organized meeting finding the right mixture between outstanding keynote lectures, oral presentation, poster flashes, interactive workshops and a tricky mystery slide session. In addition, the beautiful campus field and the nearby visitor friendly city together with the summer temperature stimulated social and scientific networking between and after the sessions. Of course these successful and impressive accomplishments would not be possible without a highly active Scientific Committee, headed by Jérôme Abadie, and the highly competent local organizing committee lead by Cornel Catoi and his highly motivated team. Thanks again to all of you. The post-meeting survey revealed that we, ESVP-ECVP, Scientific Committee and local organizers are on the right track in the way we composed and executed the meeting. The overwhelmingly positive feedback of the participants gives us support to continue with the mixture of presentations and interactive sessions for future meetings. It seems by finding a balanced meeting including diagnostic pathology, educational sessions for junior pathologist and/or trainees as well as trainers, state of the art presentations and providing scientifically sound concepts for the next generation of pathologists in academia, represents a needed and well-accepted concept for European and non-European pathologists with very different backgrounds and expectations. 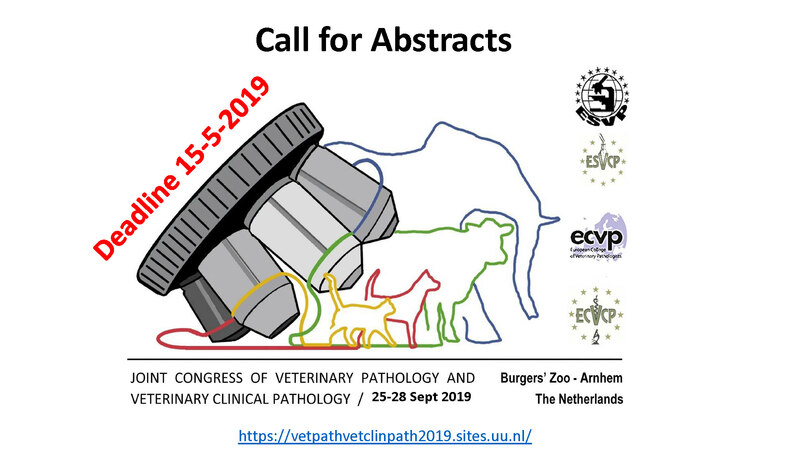 With this extremely successful meeting in my mind I am already looking forward to our next ESVP-ECVP congress, jointly organized together with our sister society, Veterinary Clinical Pathology, at September 25 – 28, 2019, in Burger´s Zoo in Arnhem in The Netherlands. However, we have some time to relax over the holidays and celebrate New Year´s Day, and I wish you a Merry Xmas and a happy, healthy and successful 2019. What a successful ESVP-ECVP meeting in Romania! 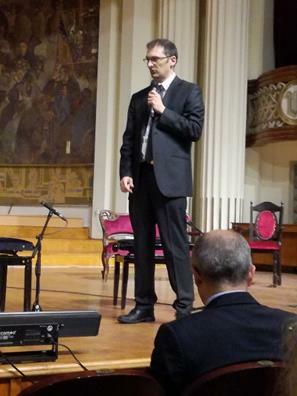 I would like to emphasize the success of our annual congress, held in Cluj-Napoca. First of all, the organization of the congress by the Local Organising committee was outstanding. Personally, I will also never forget neither the welcome reception nor the Congress dinner with such a positive atmosphere. In addition, the scientific content was relevant in so many aspects of our profession, which is always evolving. The work from the Scientific Committee has to be acknowledged as well. Last but not least, the College welcomed and celebrated the first Romanian diplomate. This underlines the College and ESVP efforts to promote and extend our profession and specialty in Eastern European countries. Hopefully, by increasing the number of diplomates and also training centers in Eastern Europe, we will promote the harmonization of training in veterinary pathology throughout Europe. We are now looking forward to our next Joint ECVP-ESVP-ECVCP-ESVCP congress (25-28th September 2019) in Arnhem, where both veterinary and clinical pathologists will get an unique opportunity to learn, meet and discuss together. The ESVP Board feels that our logo could be updated to be more visible, and we would appreciate your opinion. The current logo is shown at the top of each page of the newsletter. Therefore, we are asking you: Do you agree that ESVP logo needs a new look? Members can vote on the ESVP members’ only pages on the website. Please note that members have to register on the website to get access. Please vote for or against a change using the link here: https://www.esvp.eu/votings/do-you-agree-that-esvp-logo-needs-a-new-look. Voting will be open until 15th January 2019. In the event that the members vote for a change, we will make an open call to the members, who will be able to propose their designs. Gastrointestinal Polyps in Jack Russel Terriers with Germline Mutation of APC Gene. K. Yoshizaki, A. Hirata, N. Nishii, M. Kawabe, T. Mori§, T. Yanai and H. Sakai. Laboratory of Veterinary Pathology, Gifu University, Japan, †Division of Animal Experiment, Life Science Research Center, Gifu University, Japan, ‡Laboratory of Veterinary Internal Medicine, Gifu University, Japan and §Laboratory of Veterinary Clinical Oncology, Gifu University, Japan. Immunophenotype of Proliferative Inflammatory Atrophy (PIA) in the Canine Prostate. M. Story, C.E. Fonseca-Alves, B.W. Stringer, R. Straw, A.M. De Marzo, R. Laufer-Amorim and C. Palmieri. School of Veterinary Science, The University of Queensland, Queensland, Australia, †School of Veterinary Medicine and Animal Science, Universidade Estadual Paulista (UNESP), Brazil, ‡QIMR Berghofer Medical Research Institute, Queensland, Australia, §Brisbane Veterinary Specialist Centre, Queensland, Australia, School of Medicine, Johns Hopkins University, USA and ±School of Veterinary Science, The University of Queensland, Queensland Australia. Molecular Probes for the Distinction of Avian Haemosporidian Parasites in Tissue Samples. T. Himmel, J. Harl, C. Juan-Sallés† and H. Weissenböck. Institute of Pathology and Forensic Veterinary Medicine, University of Veterinary Medicine Vienna, Austria and †Noah's Path, Spain. A Case of Protozoal Abortion in Muskox (Ovibos Moschatus): Toxoplasmosis or Neosporosis? T.K. Jensen. National Veterinary Institute, Technical University of Denmark, Denmark. Large Calcified and Osteolytic Mass on the Distal Limb – What Else if not a Tumour? C.A. Bertram, J. Hoppe, M. Burger, J. Zentek and A.D. Gruber. Department of Veterinary Medicine at the Freie Universitaet Berlin, Institute of Veterinary Pathology, Germany, †Small Animal Surgery Dreilinden, Germany and ‡Department of Veterinary Medicine at the Freie Universitaet Berlin, Institute of Animal Nutrition, Germany. Histopathological Characterization and Proposed Prognostic Predictors in Equine Arytenoid Chondrosis/Chondropathy. P. Bolfa, M. Dennis, B. Grevemeyer, M. Cercone and N. Ducharme. Biomedical Sciences, Ross University School of Veterinary Medicine, St Kitts, †Clinical Sciences, Ross University School of Veterinary Medicine, St Kitts and ‡School of Veterinary Medicine, Cornell University, Ithaca, New York, United States. The ESVP economy is fairly balanced. We have so far a deficit for 2018 of almost 2 500€. This is partly due to a one-time cost for histology slide scanning for the website, but mainly due to the fairly high number of members not paying their yearly membership fee. I will therefore urge you, before you easily forget, to go into your internet bank and put a payment order of your membership fee to ESVP, to be executed yearly by January 31. I will also remind you of the decision we made last year at the AGM, to add a 5€ charge to those who pay with credit card. This is due to the high banking costs we have from PaySquare, who handle our credit card charges. This year we didn´t take out that extra charge due to a mistake on the credit card authorization forms, but this will be changed for next year. I will also wish you a lovely winter season and many happy holidays to come. We would like to remind you that the Society is looking for a new treasurer. This will be to start as treasurer-elect for one year to become familiar with the role, before becoming treasurer. Please contact us before the end of January 2019 if you are interested in getting involved with your Society! 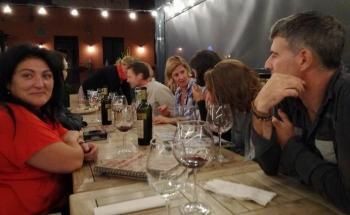 Members of the ESVP and ECVP Boards at dinner in Cluj-Napoca after long day of meetings. Laura Pena, past Chair of the Scientific Committee on the left, and Jérôme Abadie, present Chair of the Scientific Committee on the right in the front row. Members of the future LOC: Arnhem 2019: Andrea Gröne, Reinie Dijkman; Torino 2020 (Cutting Edge Pathology): Enrico Bollo. The major function of the ESVP-ECVP SC is the preparation of the scientific programme of the Annual Meeting. In order to build the most interesting proposal, the SC has analysed the results of surveys from previous congresses. Results of the feedback from the last ESVP-ECVP Congress in Cluj-Napoca showed that attendees were pleased with the location, content and format of the 2018 Meeting. The programme of the Congress included 6 keynote lectures, 4 interactive workshops, 2 educational sessions, 6 time slots for Oral presentations and a further 6 periods for dynamic Poster Flash presentations of scientific results. In addition, 97 posters were presented in the traditional format. Among the attendees of the 2018 Congress, two-thirds work in academia, 10% in industry and 20% are residents/students. The major reasons for attending the meeting were continuing education (34%) and networking (31%), followed by active contribution as presenting persons (19%). The congress met the full expectations of 36% of the audience, in most parts for 57% and in part for 7%. Regarding the scientific programme, the interest and quality of the 6 plenary lectures were scored outstanding or good for 80 to 90% of the attendees. The 2 educational sessions were evaluated as outstanding or good for 70 to 80% of the attendees. The score reached outstanding or good for 90 to 95% of the attendees for the 4 workshops (on lung pathology, neurology, bone pathology, digital pathology). Lastly, interactive mystery case presentations were scored outstanding (53%) or good (47%). The comments and suggestions for future meetings given in the survey will be used to improve our conferences, as soon as next year in Arnhem, The Netherlands (see below), which promises to be an exciting and interesting programme. We look forward to seeing you there! The European Division of the Davis Thompson DVM Foundation is delighted to announce that Drs. St Leger, Terio and McAloose, authors of the recent book on wildlife and zoo animal pathology, will be speaking at our symposium at the van der Valk hotel, Arnhem, the Netherlands, on 24 and 25 September in 2019. Drs Leger, Terio and McAloose will deliver talks including an introductory lecture on conducting a wildlife necropsy as well as lectures on the diseases of wildlife, zoo animals, marine mammals, reptiles, amphibians and wild felids. In addition we will have an interactive session each day, in the style of a gross/histology quiz, with audience participation. The Davis Thompson DVM Foundation are pleased to be working in conjunction with the ESVP and our theme of wildlife pathology complements the topics of wildlife and marine mammal pathology in the following ESVP conference. The Veterinary Faculty of the University of Ljubljana together with the Charles Louis Davis and Samuel Wesley Thompson DVM Foundation will be hosting the international ‘2nd Annual Davis-Thompson Foundation Eastern European Veterinary Pathology Meeting’ from 29th to 31st May 2019. The meeting will be held in Slovenia for the first time, at the Veterinary Faculty in Ljubljana. At the meeting veterinary pathologists will be able to hear lectures from renowned veterinary specialists. Dr. Fabio Del Piero (Louisiana State University, USA), Dr. Alex Stoll (University of Surrey, UK), Dr. Simon Priestnall (The Royal Veterinary College, UK) and Dr. Harriet Brooks-Brownlie (University of Bristol, UK) will give lectures on ruminant pathology, infectious diseases and gastrointestinal pathology of dogs and cats and veterinary forensic pathology. The 2019 ESVP/ECVP congress will be a joint congress with the Veterinary Clinical Pathology Society and Council (ESVCP/ECVCP) and will take place in the Netherlands on 25-28th September. This is a few weeks later than the regular time slot so make sure to highlight it in your calendar! This joint meeting will bring presentations of interest for both communities as well as parallel sessions on topics of specific interest to “our own” field. It will bring ample opportunity to meet with members of both specialties in a very special venue. The program will be balanced between the many areas of interest that make up the field of (clinical) pathology. The Thursday program will focus on farm animal topics and tumour classification, with a keynote lecture by Prof. Cuppen, biomedical genetics and director of the Center of Molecular Medicine of Utrecht Medical Centre. Another joint item on the program will be on the role of clinical and anatomical pathology in hematopoietic tumours by Leslie Sharkey and Nick Robinson, clinical pathologist and anatomical pathologist, respectively. A workshop on this item is also included in the program. On the topic of farm animals we are striving to make sure that the emerging diseases, as well as the classical diseases are met with a mix of workshops and lectures. The role of the pathologist in surveillance and monitoring of diseases will also be addressed. The Friday’s main subject will be directly correlated to the venue of the meeting. We are very proud to welcome the three editors from the very recently published book: Pathology of Wildlife and Zoo Animals to our congress. Judy St. Leger, Karin Terio and Denise McAloose will provide us with a unique insight in diagnostics and its challenges in all types of wildlife. Dr. Marja Kik, veterinary pathologist at Utrecht University and specialist in reptiles and amphibians will provide a workshop with unique cytologic and histologic material from the different zoos in the Netherlands, a true behind the scenes tour of the Zoo. The venue that so neatly fits this field of interest is the congress hall of Royal Burgers’ Zoo in Arnhem. This Safari Meeting Centre is located in the heart of the Zoo, with a view of an indoor jungle on one side and giraffes and wildebeests on the other. More information on Zoo and Meeting Centre can be found at their website www.burgerszoo.com. Royal Burgers’ Zoo is famous for its biotopic displays and the work that Frans De Waal and Prof. Dr. Van Hooff did with behavioral studies in chimpanzees. The city of Arnhem is located centrally in the Netherlands, with good train connections to international airports at Schiphol, Amsterdam (1 hour) and Frankfurt (1 hour 45 mins), as well as Eindhoven and Weeze (Germany) with many budget carriers flying there. Shuttle buses will be provided from the different hotels in the city to the Zoo, and Arnhem has a very good trolley-bus network if you should wish to travel on your own. Also, the connection with your own car or perhaps even bicycle is also very good. The Saturday afternoon will bring an extra program for those interested in educating residents. Professor Stephen May will share his insights and the latest scientific insights in this area. All of the above leaves plenty of opportunities for poster tours, oral communications sessions,interactive slide sessions and a lovely congress dinner. Arnhem has more to offer than a very beautiful Zoo. Close to the venue is the location of the Netherlands Open Air Museum which houses all those typical buildings that the Netherlands are famous for. The Park De Hoge Veluwe shows the other nature the Netherlands have: woods and heather, and contains the famous van Gogh collection of the Kröller-Müller Museum. The city of Arnhem is comparatively small, but with a vibrant student life and a fine cultural agenda it is very worthwhile. For many of us, the “Classic Examples” in Hannover are an important date in the calendar: it is the first important scientific meeting and the first occasion in the year to meet colleagues and friends. Our next slide seminar “Classic Examples in Toxicologic Pathology” will be held on Friday and Saturday, February 15 and 16, 2019. As in the past, it will be jointly organized by the Hannover Graduate School for Veterinary Pathobiology, Neuroinfectiology, and Translational Medicine (HGNI) and the Department of Pathology of the University of Veterinary Medicine in Hannover and the ESTP. It will take place at the Department of Pathology of the University of Veterinary Medicine in Hannover, Bünteweg 17. During the seminar, the participants will have the possibility to examine the lesions by themselves: We will provide microscopes for all participants. Sixty sets of glass slides will be provided for in maximum 120 participants. In addition, all slides to be shown, and also those from which the full set of recuts cannot be prepared, will be digitalized and demonstrated with a beamer during the seminar. Registrants will have on-line access to the digital slides some weeks prior and after the seminar. Join us for an informal get-together in the Foyer of the meeting venue on Friday evening after the end of the last session. We will provide finger food and drinks which are covered by the registration fee. Registration for the seminar is possible via the ESTP homepage (https://www.eurotoxpath.org/meetings/index.php?id=classexamp2019) by January 31. At the ESTP homepage you will also find useful information regarding accommodation. Monique Wyers graduated from the Veterinary School of Alfort, France. She started her career as a teacher in Histology and Anatomic Pathology in Veterinary School of Alfort. She was appointed as lecturer in 1966 and became the first woman to obtain the French “Agrégation”, and Associate Professor at Alfort in 1974. In 1980, she moved to the new Veterinary School of Nantes as Professor to create the department of Histology and Anatomic Pathology. Professor Monique Wyers contributed in an extraordinary manner to the advancement of veterinary pathology in France, in Europe and worldwide. She participated in the creation of the French postgraduate training programme in veterinary pathology (D.E.S.V.) in 1987. She was one of the founding members of the E.C.V.P. in 1995 and participated in the establishment of the College examination as a member of the Examination Committee. She taught many generations of veterinary students and young pathologists from France and other countries. She also guided many pathologists to success in the European Board examination, even after she retired in 2006. She was President of the S.F.A.P.V. (French Society of Veterinary pathology) from 1994 to 2006. 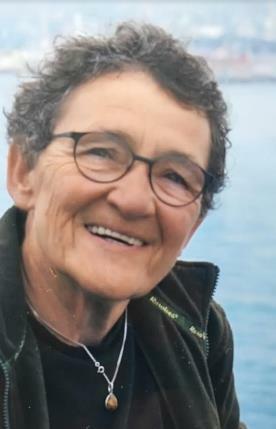 Professor Monique Wyers also conducted research work, in particular in pathology of the skeletal muscle and was a recognized expert in the field of avian pathology. Her colleagues and students will have memories of a talented pedagogue, with considerable human qualities, and of a strong and charismatic personality who devoted her life to knowledge and teaching. She was a woman of wit and culture, found of ornithology, botany, classical music, literature and of all major social questions of our time. Her death is a great loss to our discipline. She will be greatly missed by her relatives and numerous friends. Monique Wyers died on 25 September 2018, after a courageous struggle against cancer. Donations can be made in her name to the French Fondation pour la Recherche Médicale.